Disneyland park guests will be able to experience the popular nighttime spectacular “Fantasmic!” with new viewing options beginning December 12. Similar to the options for “World of Color” at Disney California Adventure park, “Fantasmic!” will feature reserved and stand-by viewing as well as several all-new dining packages. This new reserved viewing will give guests more time to enjoy other entertainment and attractions across the Disneyland Resort. 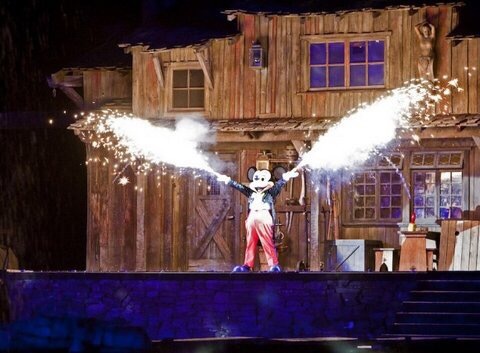 Beginning December 12, a “Fantasmic!” FASTPASS will be required to gain access to the show’s reserved viewing space. Beginning at Disneyland park opening, “Fantasmic!” FASTPASS distribution will take place along Big Thunder Trail in Frontierland. They will be distributed on a first-come, first-served basis until one hour prior to show time or while supplies last, whichever comes first. Each “Fantasmic!” FASTPASS will indicate the assigned showtime, suggested return time and assigned viewing section. Also, a non-ticketed area will be available in the “Fantasmic!” viewing area each night for limited stand-by viewing on a first-come, first-served basis. Check out all of the new “Fantasmic!” dining packages here. Reservations for December 12 and beyond will be available for booking beginning November 12. Space is limited for these experiences, so advance reservations are recommended online at disneyland.com or by calling 714-781-DINE (714-781-3463).